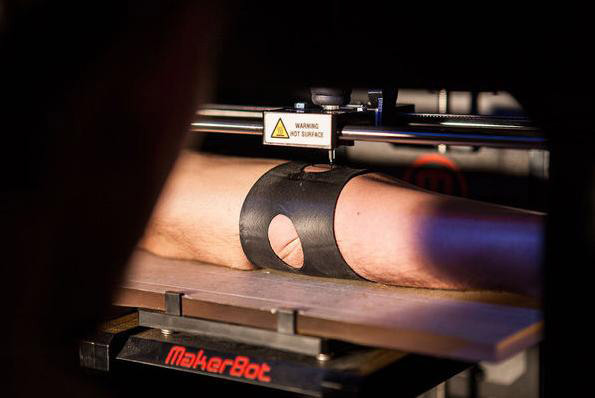 At last year’s French Ministry of Culture’s Public Domain Remix event a team from the design studio LeFabShop commandeered a Makerbot 3D printer to create the first ever robotic tattoo gun. The Public Domain Remix event encourages hackers to take an already existing electronic device and repurpose it for something else. Geek.com reports that all the team needed was an afternoon to swap out the makerbots plastic extruding jets for a tattoo needle. The Makerbot, and other 3D printers, create objects by laying out layers of melted plastic until the 3D printed creation is made. The arms that shoot out the plastic do it with precision, the kind of precision you would need if you were a tattoo artist. Before the team added the tattoo needle to the Makerbot they used a pen. They wanted to make sure that the Makerbot 3D printer would actually draw correctly. They also decided to go with a simple circle rather than an intricate tattoo. Once their test with the pen was complete the team tested the tattoo needle on a “human skin analog”. After that test they were ready to try actual human skin. After finding a volunteer, they decided to go with the volunteer’s inner arm because it was the flattest surface they could tattoo. The test was successful the machine was able to tattoo a small circle on the person’s arm. The circle was a tiny bit jagged though. The team explained that this was because in a tattoo shop the artist is holding the skin as tight as it could. They weren’t able to replicate that with the Makerbot, but of course more modifications could easily be made to keep the skin in place. While the hack itself seems pretty easy there are definitely risks associated with tattooing especially if you don’t know what you’re doing. You are working with tattoo ink and a real needle and of course an automatic machine as opposed to a real person. But if you do have a Makerbot and want to try it, Instructables has the directions posted here.